The Independent(Sep 26, 2002) America, Iraq, Russia etc etc. 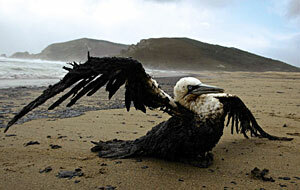 Time Magazine(Dec 2,2002)- Costa Da Morte, Spain - quite literally a "Death Coast" Oil Spill: excellent in-depth feature. Observer(Nov 24,2002) includes many gruesome archive photos and links. On Deadly Ground - listen to Steven Seagal's Town Hall Address from this anti-oil, anti-ICE action thriller.